Having recently signed to Brisbane’s alternative label Bedlam Records and off the back off the success of his last single ‘Grime Joint Part 1’ – Brisbane based artist and Zimbabwean transplant, Carmouflage Rose brings us the weekend anthem we didn’t know we needed. The infectious track, produced by Brisbane’s answer to Metro Boomin’; ‘James Angus, is filled with a tropical atmosphere and the signature dance-hall/reggae aesthetic that Carmouflage Rose so eloquently brings with his unique vocals. “Late Nights is the anthem for the house parties we all know and love, the beat that gets ya girl movin’ on the dance floor” states Carmouflage Rose. 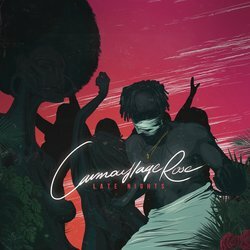 With a surge of hip hop artists helping diversify the genre in Australia, Carmouflage does his duty to bring the unique sound of his motherland into the gambit of what is on offer. A welcome injection of culture that will see him permeate his way into the international scene in time. aesthetic that Carmouflage Rose so eloquently brings with his unique vocals.